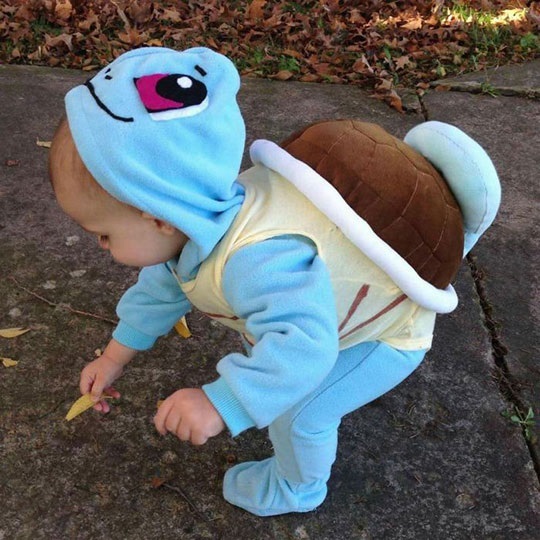 A baby wearing a squirtle costume. Image source. 1. One type of diversity we don't talk about at work: Body size (posted January 3) "Studies show that discrimination increases the higher a person's body mass index." 2. Trump’s tweet about migrant kids' deaths caps a year that was horrible for children (posted December 31) [content note: mention of child death] "The rash of school shootings and the effects of immigration policies are glaring examples of direct harm to children, but there are a host of less visible issues that also are devastating to children." Children are the most vulnerable members of society. Within any oppressed group that suffers discrimination, violence, poverty, etc, it's the children who suffer most. I believe that's why Jesus said the kingdom of heaven belongs to children. We need to do better. We need to prioritize children's needs. 4. The Women’s Resistance We Aren’t Hearing About is Happening Now In Kerala. (posted January 5) "On New Year’s Day, 5.5 million women formed a human chain across 385 miles spanning the state of Kerala, India. They demanded that the Hindu temple at Sabarimala should open its gates to women in accordance with a ruling by the Indian Supreme Court in September 2018." 6. Film Theory: What is Disney's Body Count? (posted December 9) and part 2 and part 3. Wow. Matpat goes through every Disney movie (not including sequels) and overanalyzes everything in order to calculate death counts. I love it. 7. Every congressperson along southern border opposes border wall funding (posted January 8) "One thing they actually all do have in common is that they all agree with virtual wall protection but not physical wall protection." 8. James Dobson Wants You to Pray and Fast to Protect Trump from Impeachment (posted January 8) Grosssssssssss. How will I explain this to my children. 9. Why Was Dumbledore Teaching Defense Against The Dark Arts? | Harry Potter Theory (posted January 8) I LOOOOOVE videos like this because it's EXACTLY THE SAME THING as biblical apologetics. In this case, Jon Carlin noticed that the timeline implied by a comment by Dumbledore in "Harry Potter and the Half-Blood Prince" (set in the 1990s, published in 2005) seems to contradict what we see in the movie "Fantastic Beasts 2: The Crimes of Grindelwald" (set in the 1920s, released in 2018). Because of our firm belief that both of these sources are inerrant and set in the same universe, we need to go on a grand research quest to resolve this problem. It involves reconstructing timelines based on offhand mentions of durations and dates contained throughout the canon, quibbling about sentence structure and how something may or may not mean what it first seemed to mean, and completely missing the point of the story. Yep, that's apologetics. 10. Why a Medieval Woman Had Lapis Lazuli Hidden in Her Teeth (posted January 9) Science! Did God Make Me Miss My Flight?